Fall is almost here and I couldn't stop thinking of warm and cozy foods, especially my favourite soups! A warm spicy soup on a breezy Autumn day is something that seems to be very essential on your dining table ! 1. Heat the oil and saute the onions and garlic until the onions get transparent. 2. Add the fish bones, head parts, water, parsley and cook for about 40 minutes. Drain the broth and remove the waste. 3. Add the fish cubes to this warm broth and allow it to boil. Then cook in a low flame for another 5 minutes. 4. Mix the egg yellow with lemon juice in a small bowl. Add this mix to the broth and mix well. Do not cook any further. 5. Add the salt, pepper, zimt and garnish the soup with Dill. Serve the Fish soup warm with a fresh bread ! 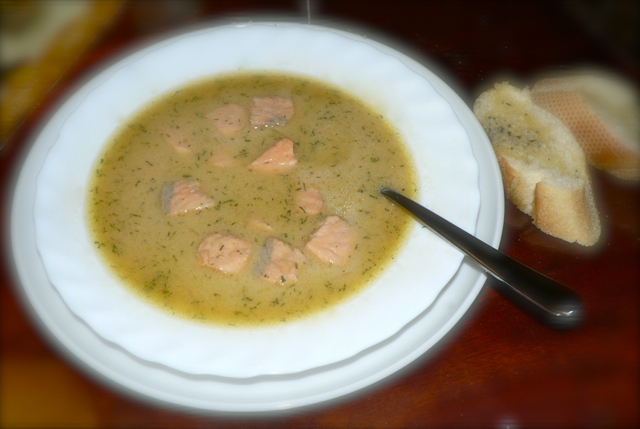 very yummy looking...i love fish soups! Flavorful fish soup...perfect for cold temperature. COmforting bowl of droolworthy soup, makes me hungry..